As we all know, Testosterone was the first steroid to be synthesized, and now it remains the gold standard of all steroids. First, we will discuss Testosterone in general, and in depth, then well examine exactly how and what the propionate ester is (together, Testosterone Propionate is often referred to as just "prop" test-p or "test prop"). Testosterone Propionate promotes nitrogen retention in the muscle (6), and the more nitrogen the muscles hold the more protein the muscles store, and the bigger the muscles get. Testosterone Propionate can also increase the levels of another anabolic hormone, IGF-1, in muscle tissue (7). IGF-1 is alone highly anabolic and can promote muscle growth. It is responsible for much of the anabolic activity of Growth Hormone (GH). Testosterones anabolic/androgenic ratio is 1:1 meaning it is exactly as anabolic as it is androgenic. Actually, testosterone is the steroid that all anabolic/androgenic ratios are based on. If a steroid is 2:1, then it is, compared with testosterones ratio, doubly as anabolic as it is androgenic. Hence, we see from testosterones ratio, it is both quite anabolic as well as androgenic. It should be noted; as Testosterone Propionate is merely testosterone, this anabolic/androgenic rating holds the same. So how exactly does Testosterone Propionate build muscle? Testosterone Propionate promotes nitrogen retention in the muscle (6), and the more nitrogen the muscles hold the more protein the muscles store, and the bigger the muscles get. Testosterone Propionate can also increase the levels of another anabolic hormone, IGF-1, in muscle tissue (7). IGF-1 is alone highly anabolic and can promote muscle growth. It is responsible for much of the anabolic activity of Growth Hormone (GH). IGF-1 is also one of the few hormones positively correlated with both muscle cell hyperplasia and hyperphasia (this means it both creates more muscle fibers as well as bigger fibers). All of this might lead one to speculate that for pure mass, IGF-1, HGH, and Testosterone Propionate would be a very effective combination. Testosterone Propionate also has the amazing ability to increase the activity of satellite cells(8). These cells play a very active role in repairing damaged muscle. Testosterone also binds to the androgen receptor (A.R.) to promote all of the A.R dependent mechanisms for muscle gain and fat loss (9), but clearly, as we've seen, this isnt the only mechanism by which it promotes growth. Testosterone Propionate has a profound ability to protect your hard earned muscle from the catabolic (muscle wasting) glucocorticoid hormones (11), and increase red blood cell production (12), and as you may know, a higher RBC count will improve endurance via better oxygenated blood. The former trait increases nitrogen retention and muscle building while the latter can improve recovery from strenuous physical activity, as well as increase endurance and tolerance to strenuous exercise. Testosterone occurs naturally in both the male and female body, as insofar as drug testing for it, typical tests dont work (i.e. testing for metabolites). Testosterone can be tested for on a testosterone/epitestosterone ratio, a failing result usually being anything over 6 to 1, but there are other more effective tests currently in use as well as being developed by the usual party-poopers in the IOC and FDA. Noteworthy is that if you are using low doses of Testosterone Propionate and stop taking it 36-48 hours before a testosterone/epitestosterone analysis, you can still pass! Testosterone Treatment only $199/month All-Included Testosterone, once in the body can be converted to both estrogen (via a process known as aromatization) as well as dihydrotestosterone (DHT). Estrogen is the main culprit for many side effects such as gynecomastia, water retention, and as a result high blood pressure while DHT is often blamed for hair loss and prostate enlargement. Naturally there are ways to combat this, such as using an anti-estrogenic compound along with your Testosterone Propionate, or even an estrogen blocker. DHT can be combated (on the scalp, to prevent hair loss) with compounds such as Ketoconazole shampoo (sold under the trade name Nizoral) as well as Finasteride (sold as Proscar in the 5mg version and as Propecia as 1mg tablets). Interestingly, this shampoo can also be used topically to combat acne on the face (or even the back if youre really flexible). Both of these methods for preventing hair loss and acne are reasonably effective; however, if you are not predisposed to male pattern baldness they will be wholly unnecessary. Male Pattern Baldness (MPB) is carried by the X chromosome, so if your mothers family boasts men with full heads of hair, then you are probably safe (unless those full heads of hair are all mullets). Naturally, as with most other steroids, your lipid profile is going to suffer a bit while supplementing with Testosterone Propionate. This, of course is nothing that cant be controlled by watching your diet and doing your cardio, at least for the duration of the typical cycle (which for arguments sake, Ill assume is +/- 12-16weeks). Lets be totally honest, here, even a modest amount of exercise will improve your blood pressure and lipid profile (10). In-order to combat the aromatization of testosterone, you can simply take an aromatase inhibitor such as Arimidex. This and other anti-estrogenic compounds are generally considered a must with testosterone doses over a gram per week (1,000mgs), and often recommended with even less. Also among side effects (as if acne and going bald arent enough) is increased aggression. This is a hotly debated issue in steroid-culture. Generally the consensus is that if you are prone to being a jerk, you'll be a bigger jerk, and if you aren't, then your temper will not get much worse (this is supported by research as well.) Interestingly enough, high levels of testosterone are generally only associated with improper aggression and anti-social behavior in males with lower intelligence (1)(2). Guess what? Dumb people shouldn't use steroids at all, especially testosterone! Testosterone is usually attached to an ester (i.e. when you buy Testosterone Propionate, the subject of this profile, you are buying testosterone with a Propionate ester attached). The ester determines how long it takes your body to dispose of the steroid in question, and Propionate is the shortest ester available with a testosterone base (of course, Testosterone Suspension has no ester). There are enzymes, called esterases, in your body that have the function of removing the ester from steroids, and leaving you with just the steroid molecule with the ester cleaved off. Depending on how heavy the ester chain is, that determines how long it takes the esterase to remove it, and that amount of time determines how long the steroid stays active in your body. Great, right? No, not t really; the ester takes up space in the injection. Here, were comparing Testosterone with no ester (suspension) with Testosterone Propionate and Testosterone Cypionate (basically the longest vs. shortest esters available with testosterone). So you see, the longer the ester on the testosterone hormone is, the longer the steroid is active in your body, and the less actual testosterone you get. This is because, for every 100mgs of Testosterone Cypionate you inject, only 69.90mgs of it is actually testosterone, the rest is the Cypionate ester, which must be removed. On the other hand, with the Propionate ester youll get 83.72mgs of testosterone! The advantage to longer esters is that they need to be injected less frequently (Testosterone Propionate needs to be injected every other day while you can shoot Testosterone Cypionate once per week). The disadvantage to long estered steroids is that they contain less actual steroid. Anecdotally, however, most people from Steroid.com and other discussion boards who have tried differing esters on their various cycles agree: Testosterone Propionate causes the least side effects and the least bloating. For this reason, its often the testosterone of choice in cutting cycles. Testosterone levels when youre using injectable Testosterone Propionate begin to decline sharply after the second day of use(5). Obviously this is not the steroid of choice for those who are squeamish about injections, youll be shooting this stuff every other day at least. Also, as with most steroids, injected testosterone will inhibit your natural testosterone levels and HPTA (Hypothalamic Pituitary Testicular Axis). A mere 100 mgs of Testosterone Propionate per week takes about 5-6 weeks to shut down the HPTA, and 250-500mgs shuts you down by week 2 (4). Realistically, every cycle should contain testosterone. Go back and read that sentence again. A beginners dose of testosterone (i.e. someone on their first or second cycle of AAS) would be in the 250-500mgs ranges. Though, realistically, we wouldnt recommend much less than 400mgs of testosterone per cycle for anybody, beginner or not who is supplementing for the purpose of performance, and guess what? The more you use the more results you get, and frequently, the more side effects too (3). Finally, its worth noting that sometimes a strategy known as "frontloading" is employed with Testosterone Propionate, this is where double or triple the intended dose for the cycle is injected for the first two weeks, then the user switches to a longer ester. The reasoning behind this is presumably to get the blood levels of the hormone up quickly in the hopes of seeing results more rapidly. Testosterone-Propionate is a short ester based anabolic steroid of the testosterone family and is one of the oldest forms available since the inception of synthetic anabolic steroids. As a short ester based testosterone Testosterone-Propionate is very easy to control in-terms of maintaining stable blood levels; an important factor in testosterone administration and therapy; however, in order to achieve this end frequent injections of the medication will prove to be of an absolute necessity. Nevertheless, those who supplement with Test-Prop as it is commonly known will find all the benefits of testosterone supplementation to be achievable via this particular form. Testosterone-Propionate is simply testosterone; compared to other forms there is no difference in-terms of mode of action as the nature of the testosterone hormone is the same in each form in-terms of benefits and function. Like all testosterone forms, Testosterone-Propionate is defined by the ester that is attached, as is the case with all forms or in some cases defined by the lack of ester attached, as can be the case in certain instances. To fully understand the compound we need only understand two things; the active hormone itself and then the ester and how it affects its mode of action in-terms of time release and active duration. Testosterone-Propionate is a highly anabolic and androgenic hormone, equal in both parts. As a testosterone based hormone it is generally well-tolerated by all who supplement with it as testosterone is naturally produced in the body and is not a foreign hormone to natural human function. Not only is testosterone naturally produced by all human beings it is essential for proper endocrine function; those who suffer from low levels of testosterone will find they suffer from a host of issues from decreases in strength and muscle tissue, decreased libido, insufficient immune system function, depression, lack of mental clarity and increases in body-fat to name a few. Conversely, those who exceed their natural testosterone levels will find each category diminished when levels are low enhanced when levels are of a higher nature. While all testosterone forms can provide the same benefits, Testosterone-Propionate functions based on the ester attached; in this case the Propionate ester. A very short ester, as such milligram for milligram Testosterone-Propionate is more powerful than many other common forms. 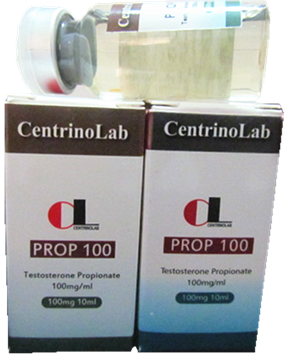 For example, another common form of testosterone is that of Testosterone-Cypionate; 100mg of Testosterone-Cypionate will yield approximately 70mg of active testosterone; however, as the Propionate ester takes up less mass in the compound 100mg of Testosterone-Propionate will yield approximately 83mg of testosterone. As a short ester based testosterone Testosterone-Propionate carries a half-life of approximately 4 days; the shortest half-life of all common ester based testosterones. As such, once administered the active hormone enters the blood stream and becomes active in full capacity very quickly but it also dissipates just as fast. For example, 100mg of Testosterone-Propionate administered on day one will fall to 50mg by day 4 and 25mg by day 8 and so on. Conversely, so that you may understand the significance, 100mg of Testosterone-Cypionate administered on day one will fall to 50mg but not until day 12 post injection. For this reason, in order to maintain stable and peak levels of the hormone in the body we must necessarily administer the hormone once every 3 days with every other day being optimal. As you can easily see the benefits are truly great and largely understood by a simple brief overview of testosterone. Testosterone greatly increases nitrogen retention thereby allowing more protein to be stored in the muscles of the body thereby increasing protein synthesis. Further, as by its nature, testosterone greatly blocks and reduces the glucocorticoid hormones in the body; the muscle wasting hormones that not only destroy muscle tissue but promote body-fat gains as well. Equally as important, as powerfully anabolic and androgenic testosterone promotes recovery and regeneration; the faster we recover the faster and greater our growth; further, the greater our regeneration the greater our athletic performance. When you couple this with its ability to increase the potent naturally occurring anabolic hormone IGF 1 you truly have a remarkable anabolic steroid in Testosterone-Propionate. These are the most common side-effects but all hope is not lost. We can greatly reduce these side-effects by taking two precautions; ensuring our diets are full of healthy omega fatty acids and through the use of quality aromatase inhibitors such as Arimidex or Letrozole. However, there is one side-effect that will occur in all men who supplement with Testosterone-Propionate and that is testicular atrophy. Exogenous testosterone use will suppress your natural production; however, once use is discontinued normal production will begin again and testicular size will return to normal.